Apply for Youth Trip Experiences - Broad River Electric Cooperative, Inc.
Broad River Electric will again be offering four local high school juniors the opportunity to experience a trip of a lifetime. 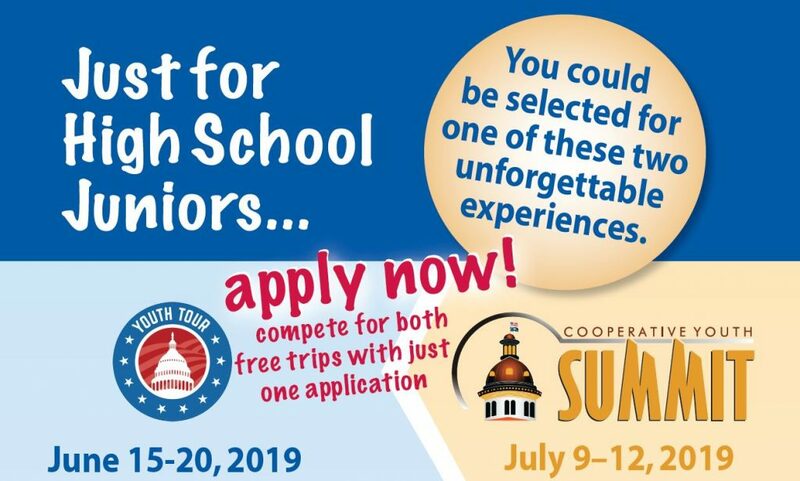 Area students in households served by Broad River Electric can now apply for the Washington Youth Tour and the Cooperative Youth Summit with a single, online application. Applications will be accepted through February 15, 2019. Two students will be selected to travel with a South Carolina delegation to our nation’s capital June 15-20, meeting lawmakers and touring the sights. Two other students will experience the state capital like never before, with a statehouse tour, leadership workshops, sessions with legislators and much more. Expenses for both trips are paid for by Broad River Electric. All students selected for either trip will be eligible for the R.D. Bennett Community Service Scholarship. Teachers and guidance counselors can also apply to participate in the Washington Youth Tour. For more information visit our Youth Trips webpage.